For other uses, see Theodosius I (disambiguation) and Flavius Theodosius (disambiguation). Flavius Theodosius was born in Cauca, Gallaecia, Hispania (according to Hydatius and Zosimus) or in Italica, Baetica, Hispania (according to Themistius, Claudius Claudianus, or Marcellinus Comes), to a senior military officer, Theodosius the Elder. Theodosius learned his military lessons by campaigning with his father's staff in Britannia where he went to help quell the Great Conspiracy in 368. In about 373, he became governor of Upper Moesia and oversaw hostilities against the Sarmatians and thereafter against the Alemanni. 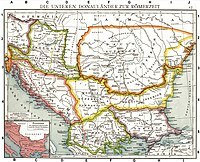 He was military commander (dux) of Moesia, a Roman province on the lower Danube, in 374, when the empire faced a formidable eruption of the Quadi and Sarmatians, the neighboring province of Illyricum being in fact briefly overrun. Theodosius is reported to have defended his province with marked ability and success. However, shortly thereafter, and at about the same time as the sudden disgrace and execution of his father, Theodosius retired to Hispania. The reason for his retirement, and the relationship (if any) between it and his father's death is uncertain, though probable. The death of Valentinian I in 375 created political pandemonium. Fearing further persecution on account of his family ties, Theodosius abruptly retired to his family estates in the province of Gallaecia (present day Galicia, Spain and northern Portugal) where he adopted the life of a provincial aristocrat. From 364 to 375, the Roman Empire was governed by two co-emperors, the brothers Valentinian I and Valens; when Valentinian died in 375, his sons, Valentinian II and Gratian, succeeded him as rulers of the Western Roman Empire. In 378, after the disastrous Battle of Adrianople where Valens was killed, Gratian invited Theodosius to take command of the Illyrian army. 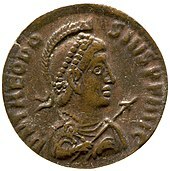 As Valens had no successor, Gratian's appointment of Theodosius amounted to a de facto invitation for Theodosius to become co-Augustus of the eastern half of the Empire. After Gratian was killed in a rebellion in 383, Theodosius appointed his own elder son, Arcadius, to be his co-ruler in the East. After the death in 392 of Valentinian II, whom Theodosius had supported against a variety of usurpations, Theodosius ruled as sole Emperor, appointing his younger son Honorius Augustus as his co-ruler of the West (Milan, on 23 January 393) and by defeating the usurper Eugenius on 6 September 394, at the Battle of the Frigidus (Vipava river, modern Slovenia) he restored peace. By his first wife, the probably Spanish Aelia Flaccilla Augusta, he had two sons, Arcadius and Honorius, and a daughter, Aelia Pulcheria; Arcadius was his heir in the East and Honorius in the West. Both Aelia Flaccilla and Pulcheria died in 385. His second wife (but never declared Augusta) was Galla, daughter of the emperor Valentinian I and his second wife Justina. Theodosius and Galla had a son, Gratian, born in 388 and who died young, and a daughter, Aelia Galla Placidia (392–450). Placidia was the only child who survived to adulthood and later became an Empress. The Goths and their allies (Vandals, Taifals, Bastarnae and the native Carpians) entrenched in the provinces of Dacia and eastern Pannonia Inferior consumed Theodosius's attention. The Gothic crisis was so dire that his co-Emperor Gratian relinquished control of the Illyrian provinces and retired to Trier in Gaul to let Theodosius operate without hindrance. A major weakness in the Roman position after the defeat at Adrianople was the recruiting of barbarians to fight against other barbarians. In order to reconstruct the Roman Army of the West, Theodosius needed to find able bodied soldiers and so he turned to the most capable men readily at hand: the barbarians recently settled in the Empire. This caused many difficulties in the battle against barbarians since the newly recruited fighters had little or no loyalty to Theodosius. It did not help that Theodosius himself was dangerously ill during many months after his elevation, being confined to his bed in Thessalonica during much of 379. 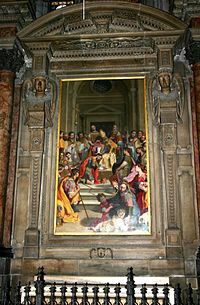 Federico Barocci, Saint Ambrose forces Emperor Theodosius I to make penance for the Thessaloniki massacre (1603), left-side nave, Saint Ambrose Altar, Milan Cathedral. Theodosius was reduced to the costly expedient of shipping his recruits to Egypt and replacing them with more seasoned Romans, but there were still switches of allegiance that resulted in military setbacks. Gratian sent generals to clear the dioceses of Illyria (Pannonia and Dalmatia) of Goths, and Theodosius was able finally to enter Constantinople on 24 November 380, after two seasons in the field. 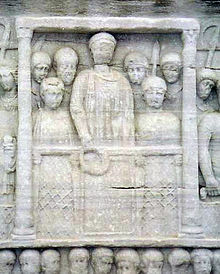 Though the weakness of his forces and the terror which filled them of the victorious Goths after Adrianople prevented Theodosius from hazarding a pitched battle to clear the enemy from the provinces, Theodosius ultimately prevailed by offering highly favorable terms to such chiefs as would desert their countrymen and agree to be enrolled under the standard of the empire. His task was rendered much easier when Athanaric, one of the most famous and powerful of the Visigothic chiefs, who had hitherto refused to enter the empire, crossed the Danube and assumed command of his countrymen. Athanaric, an aged and cautious leader, accepted Theodosius's invitation to a conference in the capital, Constantinople, and the splendor of the imperial city reportedly awed him and his fellow-chiefs into accepting Theodosius' offers. Athanaric himself died not long after, but his followers were impressed by the honorable funeral arranged for him by Theodosius into prolonging the alliance. One by one, Theodosius brought all the Visigothic chieftains into the alliance, destroying by skilled ambushes and hit-and-run tactics those who refused, until the entire nation was brought to peace. After the settlements with the Visigoths Theodosius turned his attention against the Ostrogoths under Alathaeus and Saphrax who had headed north-west into Germany after Adrianople only to reappear on the upper Danube sometime in 381 or 382. By using skilled misinformation activities in the enemy camp, Theodosius lured their chieftains into hazarding the passage of the river with a make-shift fleet of rafts and canoes, and attacked them during their passage with the war-ships of the Imperial navy. Their king Alathaeus, and most of the Ostrogothic warriors were slain, and the rest sued for clemency. According to sources prejudiced in Theodosius's favor, the emperor personally distinguished himself in the fierce fighting on the opposite bank of the river. The final treaties with the remaining Gothic forces, signed 3 October 382, permitted large contingents of barbarians, primarily Thervingian Goths, to settle in Thrace south of the Danube frontier, while the remaining Ostrogoths were settled in Asia-Minor, not initially subject to taxes, and allowed to govern themselves, on condition of supplying a fixed number of soldiers to serve in the Imperial armies. 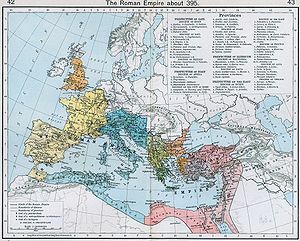 The Goths now settled within the Empire would largely fight for the Romans as a national contingent, as opposed to being fully integrated into the Roman forces. However, many barbarians, including other tribes such as Franks and Scythians, were enrolled for service in the Roman Legions, and bands of Goths switching loyalties or deserting for the sake of plunder would vex barbarian military service for the empire in Theodosius's civil wars and thereafter. ... the anger of the Emperor rose to the highest pitch, and he gratified his vindictive desire for vengeance by unsheathing the sword most unjustly and tyrannically against all, slaying the innocent and guilty alike. It is said seven thousand perished without any forms of law, and without even having judicial sentence passed upon them; but that, like ears of wheat in the time of harvest, they were alike cut down. 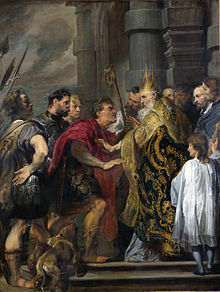 Theodosius was excommunicated by the bishop of Milan, Saint Ambrose, for the massacre. Ambrose told Theodosius to imitate David in his repentance as he had imitated him in guilt; Ambrose readmitted the emperor to the Eucharist only after several months of penance. In the last years of Theodosius's reign, one of the emerging leaders of the Goths, named Alaric, participated in Theodosius's campaign against Eugenius in 394, only to resume his rebellious behavior against Theodosius's son and eastern successor, Arcadius, shortly after Theodosius' death. In 383, Theodosius's interests turned to the western Roman Empire, where the usurper Magnus Maximus had deposed and murdered Gratian, proclaiming himself emperor of the west. This revolution of Imperial power was adverse to Theodosius' interests, since he was indebted to Gratian for his elevation and responsible for the safety of Gratian's half-brother Valentinian II, who was Augustus in Italy. Theodosius, however, was unable to do much about Maximus due to his still inadequate military capability and he was forced to keep his attention on local matters. However, he managed to assure the safety of Valentinian, extracting from Maximus a promise to respect his position in Italy. But when Maximus took advantage of the Arian Valentinian's conflict with his catholic subjects in Milan to invade Italy in 387, Theodosius felt compelled to take action. Both sides raised large armies which were composed largely of barbarians. The armies of Theodosius and Maximus fought at the Battle of the Save in 388, which saw Maximus defeated. On 28 August 388 Maximus was executed. Now the de facto ruler of the Western empire as well, Theodosius celebrated his victory in Rome on June 13 389 and stayed in Milan until 391, installing his own loyalists in senior positions including the new magister militum of the West, the Frankish general Arbogast. Valentinian II was a very young man, little more than a figurehead, with Arbogast the Frank as the true power behind the throne, controlling the appointment of the emperor's ministers and guiding by his influence the western empire's public policy. Trouble arose again, after Valentinian quarreled publicly with Arbogast, and was found hanging in his room. Arbogast announced that this had been a suicide. Arbogast, unable to assume the role of Emperor because of his non-Roman background, elected his creature Eugenius, a former teacher of rhetoric whom he had made Valentinian's master of offices. Eugenius made some limited concessions to the Roman religion; like Maximus he sought Theodosius's recognition in vain. In January 393, Theodosius gave his son Honorius the full rank of "Augustus" in the West, citing Eugenius' illegitimacy. Theodosius gathered a large army, including the Goths whom he had settled in the Eastern empire as Foederati, as well as Caucasian and Saracen auxiliaries, and marched against Eugenius. The two armies faced at the Battle of Frigidus in September 394. The battle began on 5 September 394, with Theodosius' full frontal assault on Eugenius's forces. Theodosius was repulsed on the first day, and Eugenius thought the battle to be all but over. In Theodosius's camp, the loss of the day decreased morale. It is said that Theodosius was visited by two "heavenly riders all in white" who gave him courage. The next day, the battle began again and Theodosius's forces were aided by a natural phenomenon known as the Bora, which produces cyclonic winds. The Bora blew directly against the forces of Eugenius and disrupted the line. Eugenius's camp was stormed; Arbogast committed suicide and Eugenius was captured and soon after executed. Thus Theodosius became sole Emperor. In 325, Constantine I convened the Council of Nicaea, which affirmed the doctrine that Jesus, the Son, was equal to God the Father, one with the Father, and of the same substance, or "co-essential" (homoousios in Greek). The Council condemned the teachings of Arius: who believed Jesus to be inferior to the Father. He was declared a heretic. Despite the council's ruling, controversy continued for decades. By the time of Theodosius's accession, different un-orthodox, or "un-Nicene", individuals began to bring forth alternative Christologies and views of the Persons of the Trinity. While the Nicene council paved the way for the homoousian doctrine, there remained many closer to the Arian school who attempted to bypass the Christological debate by saying that Jesus was merely like (homoios in Greek) God the father, without speaking of substance (ousia). These non-Nicenes were frequently labeled as Arians (i.e., followers of Arius) by their opponents, though not all would necessarily have identified themselves as such. For lack of a better name, they are known to history as Semi-Arians. The Emperor Valens had favored the group who used the homoios formula; this theology was prominent in much of the East and had under Constantius II gained a foothold in the West, being ratified by the synod of Rimini, though it was later abjured by a majority of the western bishops (after Constantius II's death in 361). Theodosius, in contrast to his predecessor Valens, steadfastly held to the Nicene Creed which was the interpretation that predominated in the West and was held by the important Alexandrian church. On 27 February 380, together with Gratian and Valentinian II, Theodosius issued the decree "Cunctos populos", the so-called Edict of Thessalonica, recorded in the Codex Theodosianus xvi.1.2. This declared the Nicene Trinitarian Christianity to be the only legitimate imperial religion and the only one entitled to call itself Catholic. Other Christians he described as "foolish madmen". He also ended official state support for the traditional polytheist religions and customs. On 26 November 380, two days after he had arrived in Constantinople, Theodosius expelled the non-Nicene bishop, Demophilus of Constantinople, and appointed Meletius patriarch of Antioch, and Gregory of Nazianzus, one of the Cappadocian Fathers from Cappadocia (today in Turkey), patriarch of Constantinople. Theodosius had just been baptized, by bishop Ascholius of Thessalonica, during a severe illness, as was common in the early Christian world. The Christian persecution of Roman religion under Theodosius I began in 381, after the first couple of years of his reign in the Eastern Roman Empire. 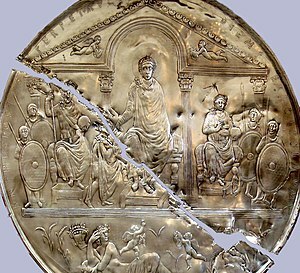 In the 380s, Theodosius I reiterated Constantine's ban on some practices of Roman religion, prohibited haruspicy on pain of death, decreed magistrates who did not enforce laws against polytheism were subject to criminal prosecution, broke up some pagan associations and tolerated attacks on Roman temples. In 393 he issued a comprehensive law that prohibited any public non-Christian religious customs, and was particularly oppressive to Manicheans. He is likely to have discontinued the ancient Olympic Games, whose last record of celebration was in 393, though archeological evidence indicates that some games were still held after this date. Theodosius died, after suffering from a disease involving severe edema, in Milan on 17 January 395. Ambrose delivered a panegyric titled De Obitu Theodosii before Stilicho and Honorius in which Ambrose praised the suppression of paganism by Theodosius. Theodosius was finally buried in Constantinople on 8 November 395. Theodosius's army rapidly dissolved after his death, with Gothic contingents raiding as far as Constantinople. As his heir in the Eastern Roman Empire he left Arcadius, who was about eighteen years old, and in the Western Roman Empire Honorius, who was ten. Neither ever showed any sign of fitness to rule, and their reigns were marked by a series of disasters. As their guardians Theodosius left Stilicho, who ruled in the name of Honorius in the Western Empire, and Flavius Rufinus who was the actual power behind the throne in the East. Several historians mark the day of Theodosius' death as the beginning of the Middle Ages. ^ In Classical Latin, Theodosius' name would be inscribed as FLAVIVS THEODOSIVS AVGVSTVS. ^ Hydatius Chronicon, year 379, II. ^ Alicia M. Canto, "Sobre el origen bético de Teodosio I el Grande, y su improbable nacimiento en Cauca de Gallaecia", Latomus 65/2, 2006, 388-421. The author points out that the city of Cauca was not part of Gallaecia, and demonstrates the probable interpolations of the traditional texts of Hydatius and Zosimus. ^ a b Williams & Friell 1995, p. 13. ^ Carr, John (2015). Fighting Emperors of Byzantium. Pen & Sword. pp. 40–43. ISBN 1783831162. ^ Williams & Friell 1995, p. 136. ^ "Theodosius I – Livius". ^ Lenski, Noel, Failure of Empire, University of California Press, 2002, ISBN 0-520-23332-8, pp235–237. ^ Williams and Friell, p54. ^ a b William and Friell, p55. ^ N Lewis; Reinhold Meyer (1990). Empire. Columbia University Press. pp. 614–. ISBN 978-0-231-07133-8. Retrieved 1 April 2013. ^ a b Charles Freeman (26 January 2010). A.D. 381: Heretics, Pagans, and the Christian State. Penguin. ISBN 978-1-59020-522-8. Retrieved 1 April 2013. ^ Madeleine Pelner Cosman; Linda Gale Jones (1 January 2009). Handbook to Life in the Medieval World, 3-Volume Set. Infobase Publishing. pp. 4–. ISBN 978-1-4381-0907-7. Retrieved 1 April 2013. ^ Grindle, Gilbert (1892) The Destruction of Paganism in the Roman Empire, pp.29–30. Quote summary: For example, Theodosius ordered Cynegius (Zosimus 4.37), the praetorian prefect of the East, to permanently close down the temples and forbade the worship of the deities throughout Egypt and the East. Most of the destruction in the East was perpetrated by Christian monks and bishops. ^ "Life of St. Martin". ^ Herbermann, Charles, ed. (1912). "Theophilus (2)" . Catholic Encyclopedia. 14. New York: Robert Appleton Company. ^ Ramsay McMullen (1984) Christianizing the Roman Empire A.D. 100–400, Yale University Press, p.90. ^ Tony Perrottet (8 June 2004). The Naked Olympics: The True Story of the Ancient Games. Random House Digital, Inc. pp. 190–. ISBN 978-1-58836-382-4. Retrieved 1 April 2013. ^ Williams and Friell, p.139. ^ Williams and Friell, p. 140. ^ "Honorius – Roman emperor". ^ Norwich, John Julius, (1996). Byzantium (First American ed.). New York: Knopf. p. 120. ISBN 0394537785. OCLC 18164817. Carr, John (2015). Fighting Emperors of Byzantium. Pen & Sword. ISBN 1783831162. Williams, Stephen; Friell, Gerard (1995). Theodosius: The Empire at Bay. Yale University Press. ISBN 0300061730. David S. Potter, The Roman Empire at Bay AD 80-395. 2004. ISBN 0-415-10058-5. Caspari, Maximilian Otto Bismarck (1911). "Theodosius (emperors)" . In Chisholm, Hugh (ed.). Encyclopædia Britannica. 26 (11th ed.). Cambridge University Press. Stokes, George Thomas (1911). "Theodosius I., the Great" . In Wace, Henry; Piercy, William C. (eds.). Dictionary of Christian Biography and Literature to the End of the Sixth Century (3rd ed.). London: John Murray. Josef Rist (1996). "Theodosios I., römischer Kaiser (379–395)". In Bautz, Traugott (ed.). Biographisch-Bibliographisches Kirchenlexikon (BBKL) (in German). 11. Herzberg: Bautz. cols. 989–994. ISBN 3-88309-064-6.